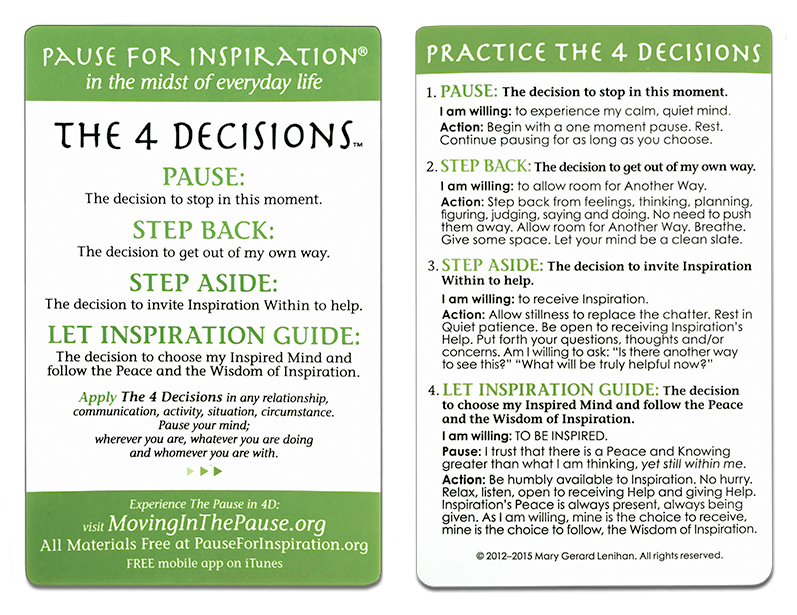 Order the 4 Decisions Cards, listen to the audio files below, and get started! WE CANNOT PREDICT WHAT INSPIRATION WILL LOOK LIKE OR WHAT INSPIRATION WILL SAY. WE NEED SIMPLY BE WILLING TO RECEIVE IT AND GIVE IT AWAY. THIS IS BEING INSPIRED TO BE TRULY HELPFUL! Click on the player below to listen to (or download) Part 1 – The 4 Decisions Introduction. Click on the player below to listen to (or download) The 4 Decisions – A Guided Practice Short Version (1:16).